Welcome to ResDiary 9.6! 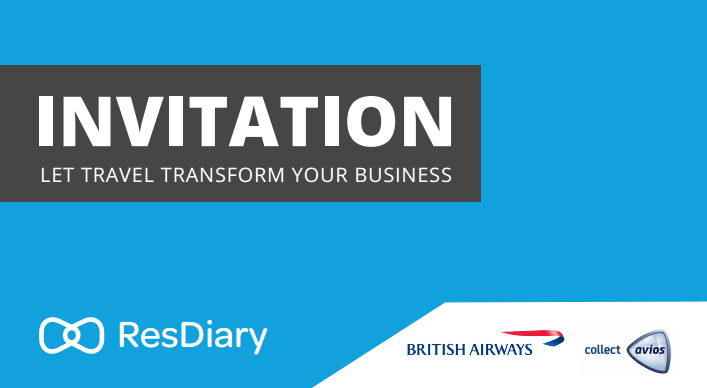 Discover our new diner loyalty programme with Avios and learn how travel can transform your business. See our updated user permissions settings of Full access and View only. Read about the improved Stripe landing page which makes storing guest’s credit cards easier . See how we have restyled sections of the diary for a better user experience and find out how Diners can now edit / amend their bookings. Learn more below, including support articles and tutorial videos. Please remember to clear your cache to access all new functionality fully. ResDiary has partnered with Avios and will be powering their new dining portal. Customers with a diner profile on ResDiary.com can now collect 250 Avios points when making a reservation and dining at participating restaurants. Click here to discover how your restaurant can participate. Now, administrators can set users with “Full Access” or “Read only” access to the diary. This allows junior team members to view information and reports, but not make changes or mistakes. This feature is made for large teams where a lot of people may need to access the system for info but not necessarily require full access. Administrators can set “Full access” users with the ability to override card payment requirements or manually input card details in order to complete a reservation enquiry instantly. This will also stop the system automatically sending emails asking for details being sent to that customer, meaning your VIPs and get VIP treatment with no hassle and you can be flexible when it comes to more complex booking scenarios. Last month we revealed our new ‘Diner Profiles’ on ResDiary.com – which allowed diners to save their favourite restaurants , view their booking history and collect Avios points at participating restaurants. This month we have added in a new feature for diners – the ability to edit and cancel reservations. Do you like our style? You may have noticed, we’ve been restyling pages and enhancing your user experience of ResDiary for a while now. This month we have revamped two new sections -just in time for Christmas prep! Take a look at the new ‘Segments’ section with a new filter setting, also see the new look ‘Restaurant Areas’ with added visibility of online reservation settings in the list view.